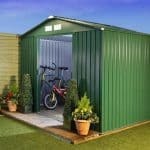 Even relatively small metal sheds can bring big advantages, as shown by this good value garden building from Store More. It’s ideal for smaller gardens where space is at a premium and it can even be affixed to a level patio area. Once up, you’ll have a weatherproof location to store all your tools and equipment, and this is backed up by a 10 year manufacturer’s warranty against perforations that are caused by rust. We really liked the anthracite colour of this shed, it gives it a unique and attractive look that stands out from standard silver or green metal sheds. The layers of paint also add a further protective coating against rain. This protection is further enhanced by both the apex roof which carries rainwater away, and by the galvanised nature of the strong metal cladding. One area that the shed could do slightly better on is its height, as you really have to bend down to get inside. This needn’t be a major problem however, as it’s a shed to be used as a storage facility rather than one to spend time in, and the strong ramp makes it easy to transport heavy or bulky items in and out. 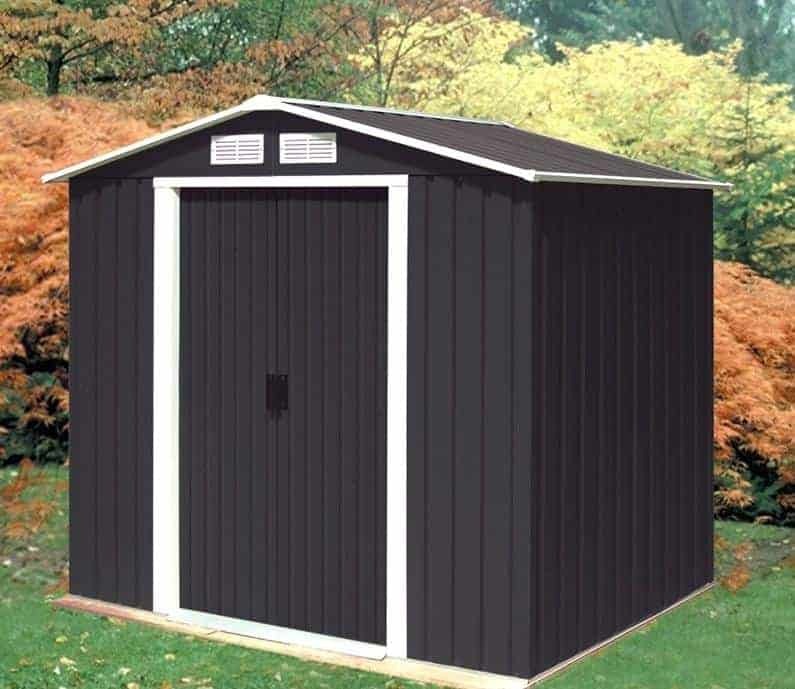 The stand out feature of this shed is its attractive dark grey, or anthracite, colour scheme. Well executed with water resistant metal paint, it looks strikingly different to the majority of metal sheds we review, especially thanks to its contrasting white trim. Looks wise, this is a shed that you’ll be proud to have in your garden. Equally noticeable is its lack of height, although this becomes most noticeable when going through the door. 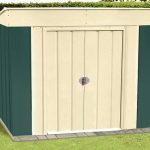 If you have a small garden however, or want a shed that doesn’t stand out too obtrusively above the level of your fence, then this is worthy of consideration. The rain repelling apex roof adds a little extra vertical space thanks to its ridge height of 1.89m, but the eaves height is 1.60m. When selecting a site for the base, it will need to at least match the outer dimensions of 1.95 in width and 1.13 in depth, although these are both extended by the overhang of the roof. The metal cladding on this shed is much stronger than its thin and light nature would suggest. This means that while you’ll find it easy to manoeuvre the components during assembly (although do watch out for the sharp edges), it is both strong and stable when fully constructed. This extra strength comes from the specially folded galvanised cladding, which creates extra rigidity as well as keeping water out. There is no floor included here, which is unsurprising for a metal shed of this price, but we would have liked to see an anchor kit supplied as standard. 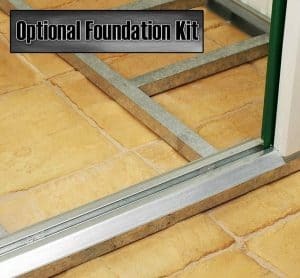 The lack of such a kit means that the customer will have to make an extra purchase even if they only want to screw the shed down to an already existing base of level concrete. Being made of already painted metal, there are no treatment requirements for the customer, which those who have been used to the annual treatments necessary for timber sheds will be glad to find. A 10 year manufacturer’s warranty is provided against the appearance of perforations caused by rust, but because the cladding is so effective at stopping water penetration we feel that this warranty period could have been even longer. As it is, the warranty is at the lower end of those we see. The double sliding doors are in the same anthracite colour, surrounded by white trim. We were glad to find that they had been fitted internally, as this protects the sliding mechanism and the door itself from impact, whether accidental or intentional. Their width of 0.90m was easily enough to get most objects inside without a struggle, even though the door height of 1.54m will feel very restrictive for people of average or above average height. One feature we particularly liked about the doors was its entrance and exit ramp. Strong and durable, it allows a wheelbarrow or trolley to be used to take heavier goods in and out. There are no windows in this shed, but we were happy with the well sized vents on the gables. It means that there’s a constant supply of fresh air into the shed which keeps the interior pleasantly cool and can also help to fight condensation. Because there are no windows this shed offers excellent privacy, and we also feel that this enhances security as potential thieves won’t know if anything valuable is kept inside. One thing that could have greatly improved security, however, would have been the inclusion of a padlock. We’d strongly recommend purchasing one, and thankfully the handles are ready holed so fitting one is easy. 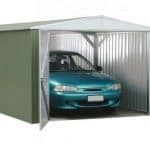 There are two optional extras available that we feel could or should have been included at the time of purchase, although we do appreciate that this shed does come within the budget price range. The first is a set of rust free Hilti screws. These act as an anchor kit and with the included drill bit make it simple to attach your new shed onto a flat area of concrete. If no such concrete area, or alternatively a suitably sized area of patio or paving, then it will need to be constructed. 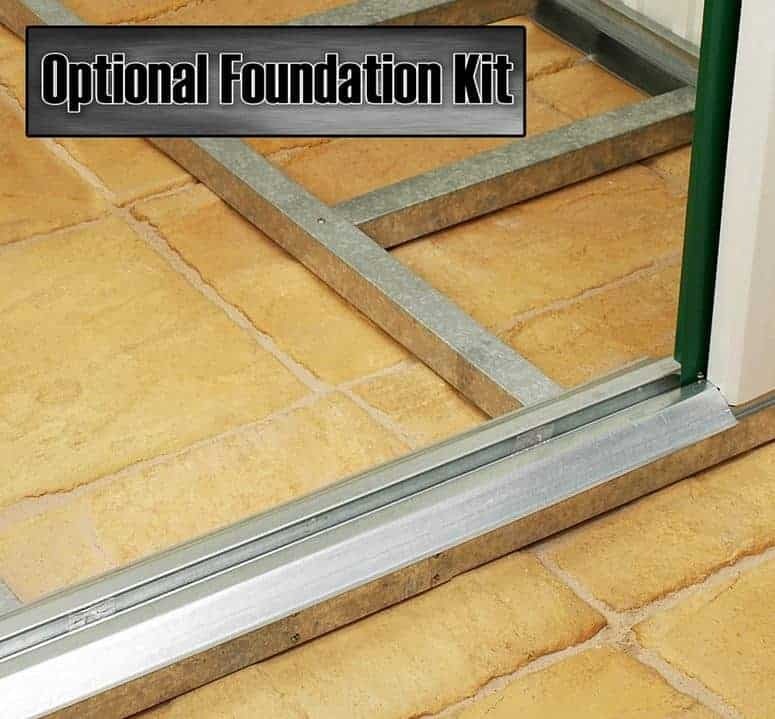 The optional steel foundation kit helps you do just that, although it does add fifty pounds to the price you’ll pay. Despite its very affordable price point, it was good to see that Store More haven’t cut corners when it comes to quality. The attractive paintwork is a good indication of the overall attention to detail. The cladding isn’t the thickest that we find of metal sheds we review, although its folded nature means that it should easily last out the 10 year warranty period. 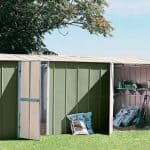 This is very much a small footprint shed, but that in itself makes it very suitable for those with a modestly sized garden who don’t want to take too much space away from the lawn or bedding areas. We were pleased at how easy this shed is to install. You will need two people, especially when it comes to attaching the apex roof, but you can complete the assembly in around three or four hours. 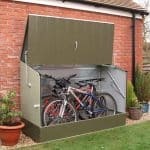 If an anchor kit or flooring kit had been included with the shed then it would have scored higher in this category, but even so it is a good looking waterproof storage facility at under two hundred pounds. Final Thoughts: You won’t be tired of seeing this aesthetically pleasing anthracite coloured shed in your garden, and the good thing is that the apex roof and galvanised cladding should combine to keep it looking just as good for years to come. It also means that the contents of the shed will be kept dry, and they’ll also be protected from the potentially damaging effect of condensation and temperature extremes, thanks to the integrated ventilation. It’s a feature we really appreciated, as is the strong ramp which is ideal for people who want to store and retrieve heavier items such as bags of soil or concrete in their shed.